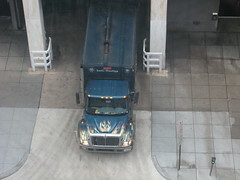 You might’ve seen the news on JDLand or DCist about the beeping truck over at New Jersey Ave & K St SE. Reader Shaun Farrell pointed it out to us on Monday morning and requested our assistance. When email to DPW went unanswered, we gave them a call and got to the bottom of the situation. The truck in question at the trash transfer station seemed to be making the noise, and it had been ongoing since August 21st according to area residents. As window weather is again here, and this is driving some people crazy, we ended up talking to Miss West with the DPW, who explained it was the truck’s crash attenuator. It was stuck in the on position, which meant that the truck was annoying the bejeezus out of people. She gave me the number for the weekend maintenance folks, which we passed on to the residents who had complained, and all seems to be well. Why it had to go on for 10 days before they’d fix it, she wasn’t sure, nor was it clear why a local media outlet had to get involved before it got done. But, it is once again quiet near Capitol Towers.